President Muhammadu Buhari on Thursday stressed the importance of deepening relationship with other nations noting that this is important for his administration to achieve its goals. According to a statement signed by the President’s Special Adviser on Media and Publicity, Femi Adesina, President Buhari said this while receiving the outgoing Ambassadors of the Federal Democratic Republic of Ethiopia, and the Republic of Turkey at Presidential Villa in Abuja. “The President said the core policies of his administration – securing the country, fighting corruption, and reviving the economy – cannot be effectively done without good neighbourliness and deepening of the relationship with allies. “Security and economic development are crucial to any country, and that was why I visited our immediate neighbours once I got to the office,” the statement read in part. He assured that Nigeria under his administration will continue to deepen relationships with her allies, particularly those with whom she shares mutually beneficial interests. 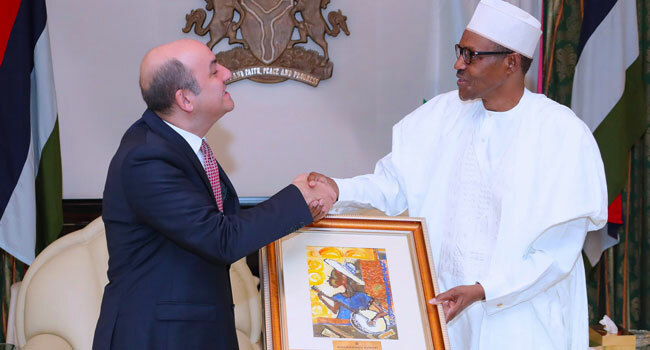 President Muhammadu Buhari presents a gift to the outgoing Ambassador of the Republic of Turkey to Nigeria, Mr Hakan Cakil during a farewell visit at the Presidential villa in Abuja on Thursday, June 14. PHOTO: SUNDAY AGHAEZE. President Buhari explaining further why he visited some countries upon assuming office in 2015 said this is due to the benefits of establishing strong and friendly ties with other nations. “I visited Chad, Niger, Cameroon, and Benin Republic. You will spend less money on security, and deploy more resources to the infrastructural development when you are in good terms with your neighbours,” he added. 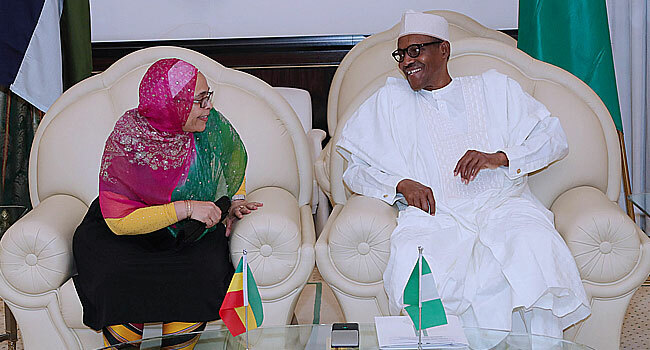 In response the outgoing Ambassador of the Federal Democratic Republic of Ethiopia to Nigeria, Samina Zekaria Gutu described Nigeria and Ethiopia as “strategic partners” who have a deep relationship. According to her, over three-year of her stay in Nigeria was a period that saw the furtherance of bilateral relations between the two countries. During the audience with Hakan Cakil of the Republic of Turkey, President Buhari congratulated the outgoing Ambassador on the close relationship between the two countries and thanked Turkey for academic scholarships granted scores of young Nigerians in recent times. He also lauded government and private investments in Nigeria in diverse areas like education, medical institutions, and others. In response, Ambassador Cakil said Nigeria was his country’s most strategic partner in sub-Saharan Africa.